The 1980 crime comedy sentenced to Blu-ray this December won't be arriving until late January. As previously reported, Image Entertainment was working on 'Stir Crazy' for Blu-ray on December 6, but now the date has been pushed to January 24. The film about two innocent friends who are framed and sent to prison stars Gene Wilder and Richard Pryor and is directed by Sidney Poitier. The Blu-ray will feature 1080p video, a DTS-HD Master Audio 2.0 soundtrack, and supplements will include talent filmographies and trailers. 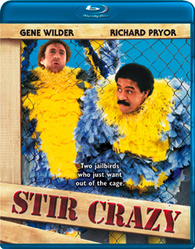 You can find the latest specs for 'Stir Crazy' linked from our Blu-ray Release Schedule, where it's now indexed under January 24.